The first time I made it, I did so in the Instant Pot. It turned out well enough, but I really wanted this to be a stew that everyone could cook. Not just those with a pressure cooker. I also ended up adding in some potatoes and carrots to make this a more veggie-ful dish. Those veggies, along with the beans in there, really makes this a hearty meal all on it’s own. I’m sure that you’re asking yourself by now… what makes this stew a ‘sailor’ stew. Well, I’ll tell you! This is sailor stew merely because it’s got RUM in it. Not just any rum either. It’s spiced rum with adds to the warm flavors and other spices that are in it. Don’t worry, the alcohol cooks out and leaves behind only the flavor of the rum and not the actual contents of it. Being as this soup is pretty much a one-pot-meal, I can’t really say that you’ll need much (if anything) to serve it along with. The potatoes in there are plenty of a starchy and filling vegetable to satisfy the masses. That being said, there’s never anything wrong with having a nice thick bread to dip in and soak up all that stew goodness at the bottom of the bowl. 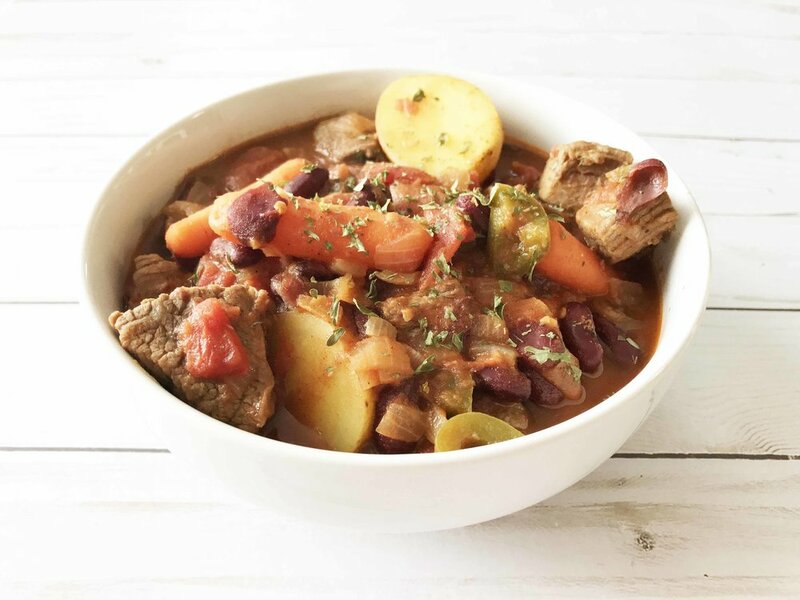 This stew makes for great leftovers and is easily re-heatable with just a few minutes covered in the microwave to enjoy it all over again. If there are any leftovers that is. My mom enjoyed this stew so much that she actually hijacked the unfinished recipe and then called me to ask for the directions. Too bad, so sad! That’s what happens when you steal from your daughter. Haha. 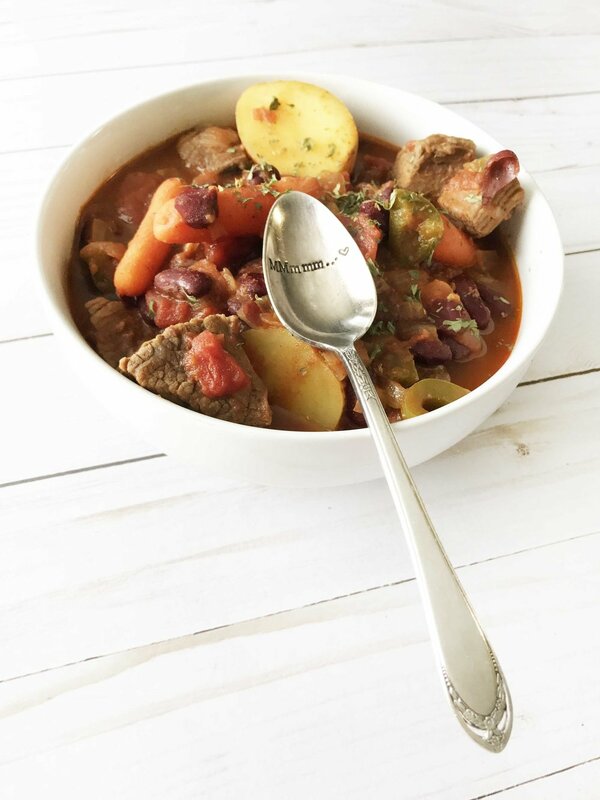 Eat stew like a sailor drinks! 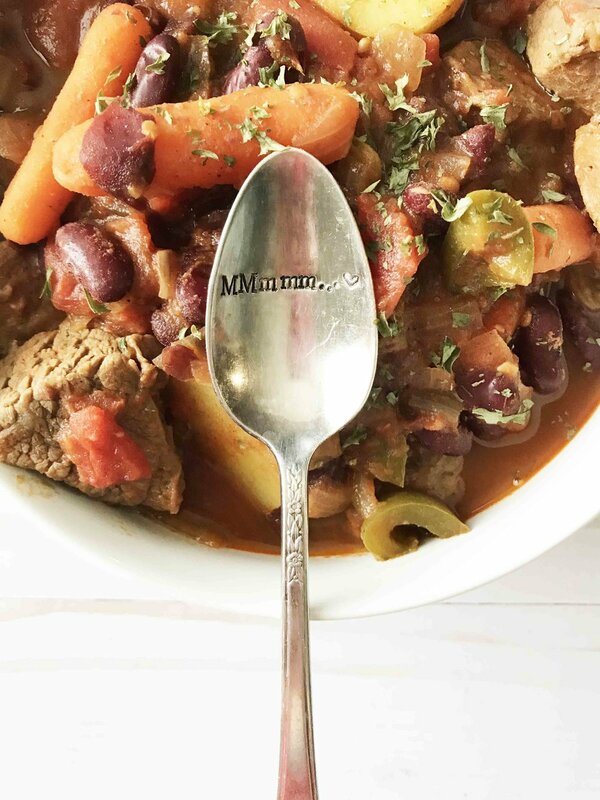 This beef stew is made with none other than some spiced rum for added flavor and a little kick in the pants. Place the 1 Tbsp. oil into the base of a large soup or stock pot and heat over a medium-high heat. Once hot, add in the 1 chopped onion, 2 garlic cloves, 1 Tsp. chili powder, 1 Tsp. smoked paprika, and 1 Tsp. cumin. Cook until the onion is starting to become tender, about 5 minutes. Add in the 1 Lb. stew meat and brown slightly, about 10 minutes. 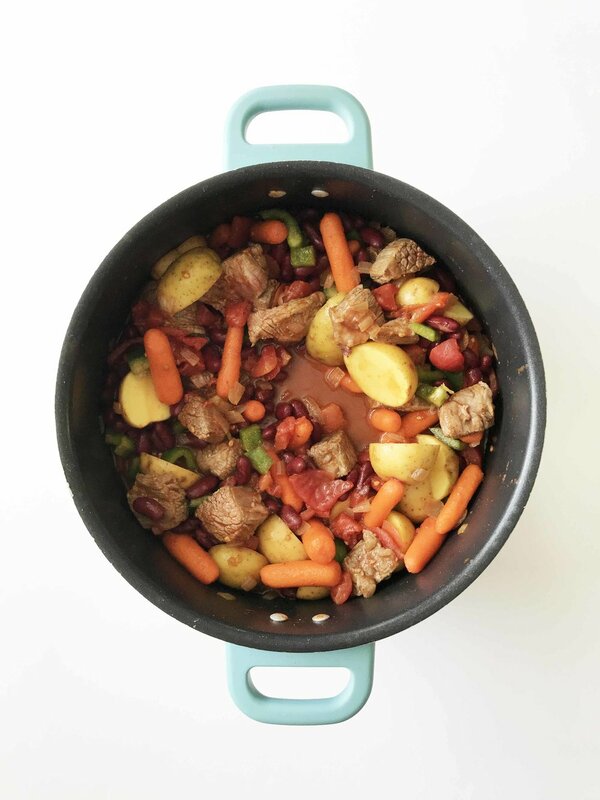 When the beef is browned and the onion is translucent and tender, add in the potatoes, carrots, 1 can diced tomatoes, 1 can kidney beans, 1 green bell, 3 Tbsp. spiced rum, beef bullion, 2 Tbsp. tomato sauce, 1 Tsp. brown sugar, and 1/2 Tsp. marjoram. Bring it all to a boil and reduce heat to simmer for 20-30 minutes. 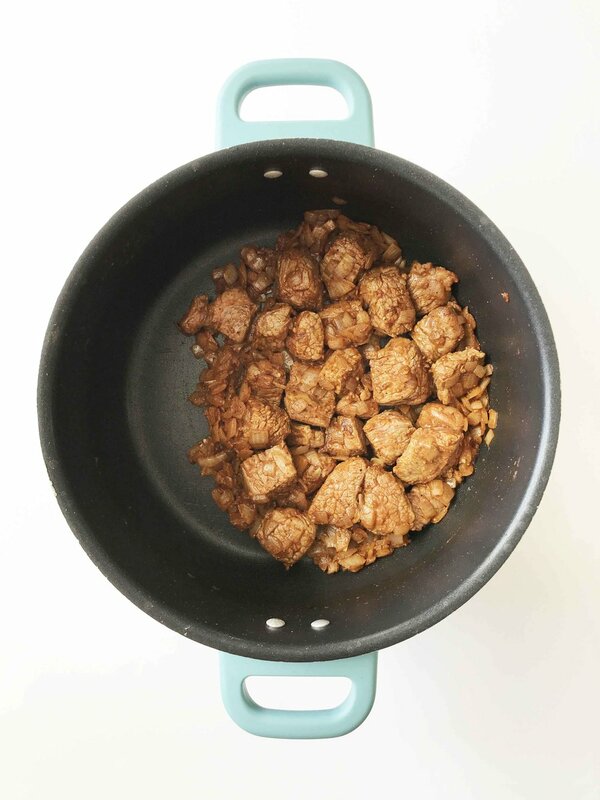 Once done, remove from the heat and divide evenly among bowls to enjoy right away!